About five inches long with radiant colors. Conspicuous black eyes and beak stand out from the rich orange head. Orange neck, throat and breast with lighter belly. Greenish yellow back. Blue-gray wings and tail. 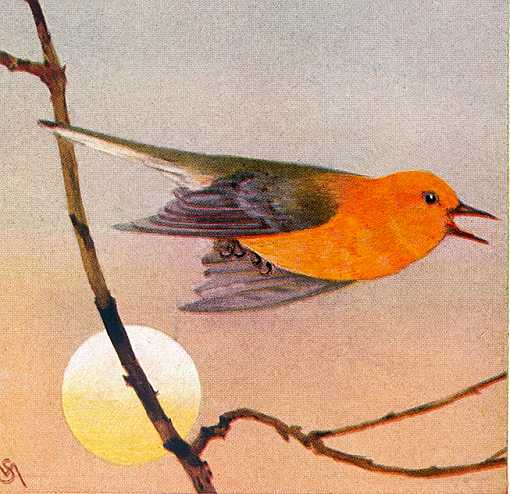 Prothonotary warblers inhabit woodland bordered swamps, ponds and stream bottom lands east of the Great Plains from the Gulf States along the Mississippi Valley to Minnesota, and the lower Great Lakes States, to the eastern seaboard from Florida to New York, occasionally as far north as Maine. 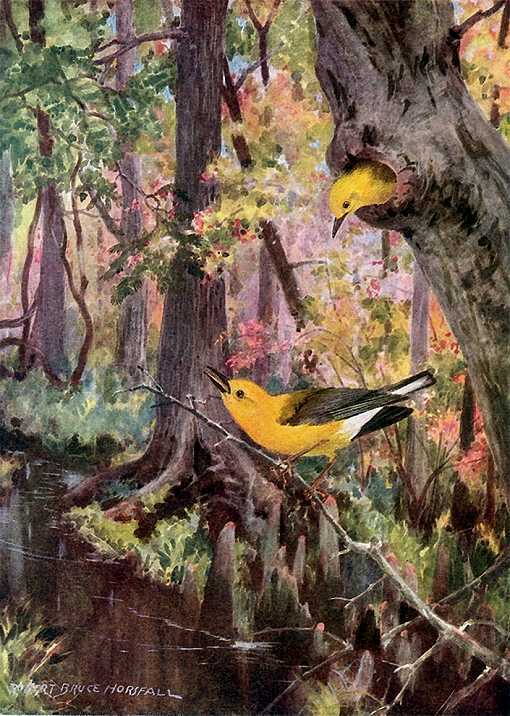 Prothonotary warblers are best observed in their habitat from a canoe. They forage for insects in bushes, low trees and other thick foliage, often willow trees over water. Build nests of twigs, leaves and moss in natural or abandoned cavities low to the ground in decaying stumps and up to fifteen feet high in trees overhanging or standing in water. Female lays four to seven creamy-white speckled eggs which hatch after about two weeks incubation and young leave the nest in about another two weeks. The Prothonotary Warbler Birdhouse has a 5″ by 5″ floor, 6″ inside floor to ceiling, 1 1/8″ diameter entrance hole located 5″ above the floor and ventilation openings. Use rough-cut wood stock and assemble with corrosion resistant screws fit to pre-drilled countersunk pilot holes. Secure a hinged roof with shutter hooks for easy access. Mount on a tree, stump, or post over water from waist level up to an extended reach. Remove the nest and clean the box after the brood rearing season is past. Use rough-cut wood stock and assemble with corrosion resistant screws fit to pre-drilled countersunk pilot holes. Secure a hinged roof with shutter hooks for easy access.